Centennial, Colo. – Boxing fans across the nation will have a ringside seat when Fathom Events, Golden Boy Promotions and Canelo Promotions bring the highly-anticipated 12-round bout between boxing superstar Canelo Alvarez and the relentless Alfredo “El Perro” Angulo on Saturday, March 8 at 9:00 p.m. ET / 8:00 p.m. CT / 7:00 p.m. MT / 6:00 p.m. PT / 5:00 p.m. AK / 4:00 p.m. HI. 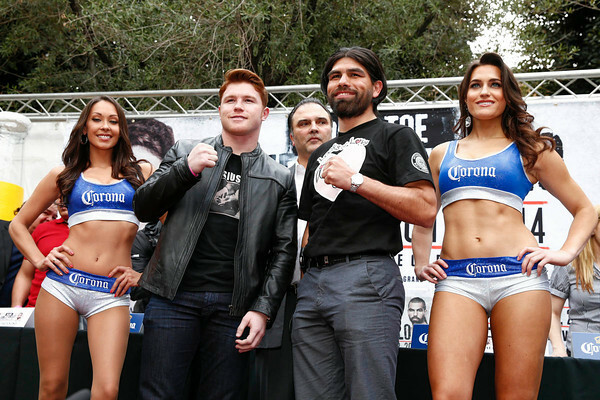 “Toe to Toe: Canelo vs. Angulo” will be broadcast live to select theaters nationwideforan action-packed fight from the MGM Grand Garden Arena in Las Vegas that assures redemption for just one of these elite fighters. The fight card also features Two-Division World Champion Leo “Terremoto” Santa Cruz (27-0-1, 15 KO’s) against Former World Champion Cristian “El Diamante” Mijares (49-7-2, 24 KO’s), WBC Lightweight World Champion Omar “Panterita” Figueroa (24-0-1, 17 KO’s) opposite Canelo’s older brother, Lightweight Contender Ricardo “Dinamita” Alvarez (23-2-3, 14 KO’s), as well as IBF Middleweight World Champion “King” Carlos Molina (22-5-2, 6 KO’s)against undefeated Jermall Charlo (17-0, 13 KO’s). Tickets for “Toe to Toe: Canelo vs. Angulo” are available at participating theater box offices and online at www.FathomEvents.com. For a complete list of theater locations and prices, visit the Fathom Events website (theaters and participants are subject to change). The event will be broadcast to nearly 400 select movie theaters across the country through Fathom’s Digital Broadcast Network. “March 8 will be a huge night for boxing, and as we team up with Fathom Events once again, fight fans in movie theaters around the United States will be able to experience the entire Canelo vs. Angulo event like they never have before,” said Richard Schaefer, CEO of Golden Boy Promotions. Mexican boxing superhero and pride of Guadalajara, Jalisco, Mexico, Canelo Alvarez (42-1-1, 30 KO’s) returns to the ring hungrier than ever after a hard-fought loss to the pound for pound king Floyd Mayweather in September 2013. His bout against Mayweather marked the highest grossing pay-per-view event in history and made him a hero to thousands of boxing fans all around the world. Now, six months later, the 23-year-old is ready to make his highly anticipated ring return and prove to the world that he really does belong amongst the elite fighters of his generation. Alfredo “El Perro” Angulo (22-3, 18 KO’s) from Mexicali, Baja California, Mexico is a fan-favorite in the boxing world. The 31-year-old star embodies the guts and glory of a true Mexican warrior and has every intention of demonstrating this against the younger Canelo. Like Canelo, Angulo is also coming off of a controversial loss after suffering an eye injury during the ninth round of an exciting showdown against top Super Welterweight Erislandy Lara in June 2013. A win against Canelo would cement Angulo’s status as one of boxing’s most dangerous fighters and catapult him to the top of the list of world title contenders.